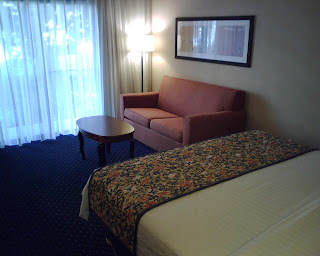 I recently stayed at the Courtyard in Bellevue for 1 night on business in a king room. The hotel grounds is standard Courtyard and very well maintained. Check in was very efficient and the front desk staff were wonderful, it always makes a difference to have someone cheerful who enjoys what they do at the front desk and this hotel has wonderful staff. The rooms surprised me, it has been a long time since I stayed in a Courtyard hotel but the room was great. The bed was very comfortable and the room also had a fantastic desk and sofa. 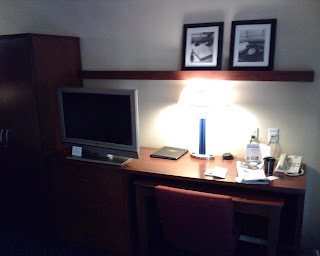 The TV was a flat screen plasma with lots of stations and everything was well maintained and comfortable. The room also had a patio or balcony depending on what floor you are on. I am usually a frequent Hilton brand hotel person, but this Courtyard was very nice and I would have no problem returning to this hotel in the future. My friends from Hawaii always stay there and seem to like it too. I'm glad you had a pleasant stay and would love to hear your impressions about Bellevue and the Eastside in general.